This entry was posted on Monday, August 26th, 2013 by Frances Ryan. I’m not a big fan of the rain but when the skies open up I do find myself looking—and hoping—for a rainbow. Rainbows make me smile; they make me happy; they warm my soul. So, I’ve decided that I will try something new by looking—and hoping—for a rainbow in my tears. You know, because tears are sort of like rain. There have been a lot of tears these past few weeks as I’ve been met with the realisation that earlier visa glitches* mean I have to return to America—and I have to do so in fairly short order. I’ve been a little bit extremely panicked and slightly very hysterical at times. And I’ve cried and cried and cried. Some of my tears have been because I’m fearful that there will be further glitches when I return to America which may delay—or prevent—the start of my PhD studies. Some of the tears have been because the whole process has drawn up past emotions of moving house. And some of the tears have been because I am still recoiling from a couple of other very upsetting recent events. But, with the help of my friends, I’ve slowly been finding the rainbows. And when the rainbows come out, it generally means the rain (or tears in the case of today’s weak metaphor) begins to subside. I’m sure there will be loads of other rainbows over the next several weeks, too. And, hopefully, some of them will appear because of rain and garden sprinklers rather than tears! * As promised earlier, I will give a full update of my visa glitches later. 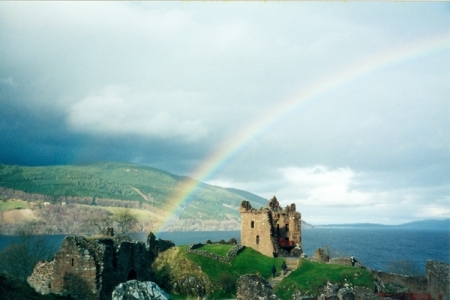 Photograph note: This photo was taken at Urquhart Castle on the shores of Loch Ness in March 2002 when my best friend, Rachel, came to visit me from America.